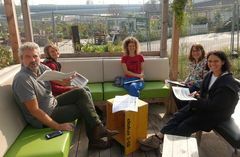 The UGAIN partners met in Vienna in October to discuss and choose case studies for each country which will highlight best practice for working with refugees and asylum seekers in community and urban gardens in the 5 countries. Each of the case studies will show how the social integration and empowerment of migrants within the urban/community garden context focuses on subjects such as training, skills, lesson learnt, challenges faced and the impact this kind of work is having in the communities which they are in. Partners will now interview the projects chosen in each of their countries using a questionnaire and the criteria agreed by the partners. The case studies will be presented to the partners during our 4th meeting in Sweden in May 2019. Our hosting partner Gartenpolylog took us to see several urban gardens in Vienna on the second day including a garden managed by mostly Afghani gardeners who were growing special herbs from Afghanistan that are expensive and difficult to get in Austria and a community garden comprised of local people and migrants which encouraged cooking together and running other social events. We look forward to sharing our case study information in Sweden in 2019.